SCAVENGER by nature, Old World vultures are found in Africa, Asia and Europe. They have been regular visitors to the bloody battlefields since the history of wars started.It is said the ancient Abyssinian armies were accompanied overhead by flocks of vultures, and in another example during the Crimean War shooting parties were sent to scare off these scavengers because badly injured soldiers who were unable to move and defend themselves from these birds were in danger of being attacked and torn apart by them. Now studies have shown that different species of vultures have specialised in eating different parts of the carcass. This is the reason that despite feasting on one body these birds do not face any competition among themselves. In East Africa it was observed that while eating, different species follow a strict order of feeding. On the same carcass they feed in the order of Black vulture, then Lappet-faced, then Griffon, Egyptian and Hooded vulture. For example, aggressive Lappet-faced vultures prefer skin, tendons, and other coarse tissues. In other words they open up the body which is difficult for other species to do. Griffon vultures have sharp-edged bill for cutting meat and a serrated tongue to help swallow it quickly. The crop of the bird is quite big and can take a quarter of the birds body weight in food. They feed on the soft and fleshy parts of the body. 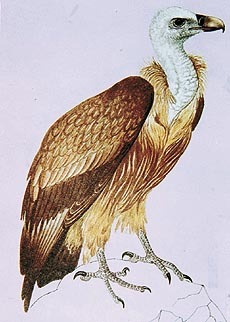 Species with naked head and neck, including Lappet-faced, have the added advantage of inserting their head inside the carcass without spoiling their plumage. Apart from the above two species, Egyptian vultures, who have thin beak, content themselves with the leftovers. This order of feeding not only avoids competition but also ensures speedy and clean disposal of the body. Vultures have very efficient digestive system which is able to extract even the last drop of nutrients from the most degraded food source. This is the reason when these birds do not find any carcass they take to eating dung, but not just any old dung. Their preference is the excreta of big cats who do not digest their food as well as the dogs do. The result is that lions dung contain 10 per cent more undigested food which is consumed by these birds. Vulture chicks depend on spotted hyenas, and such other creatures, for their supply of calcium which is very necessary for the healthy development of their bones. They need pieces of bones in their food so that their body can extract calcium from it, but unfortunately the meat regurgitated by their parents has little calcium. In such situations parents depend on hyenas who, with their powerful teeth and jaws, can break up even the toughest of bones. They ignore very small fragments which are taken up by these birds for their young. In the Indian subcontinent no vulture is found beyond the southern tip of India. While even small land birds, like the paradise flycatcher, cross over to Sri Lanka from India, no vulture crosses the negligible sea barrier. Only one or two scavenger vultures have been spotted in Sri Lanka. While these strong fliers are seen in abundance in South India, their absence across the Palk Strait is inexplicable. Being heavy-bodied birds with large wings vultures can cruise on air currents without flapping their wings for a long time. They utilise the up-drafts generated by warm air currents. Ruppells griffon vulture, belonging chiefly to the drier parts of Africa, is the highest-flying bird in the world. In one recorded instance this bird had collided with an aircraft at the altitude of 37,000 ft or 11,274 metres over Abidjan, Ivory Coast, Western Africa. The incident took place on November 29, 1973. Fortunately there was no loss of life and the plane landed safely with one damaged engine. Why do these birds select such a high altitude as a flight path? The reason suggested is thinner air allows faster flight without much effort, thus saving precious energy. While flying at a higher altitude vultures face almost no physiological problem with regard to breathing. They have much more efficient system than other living beings, including humans. Their flow of blood enables oxygen to be extracted from air with far greater efficiency than that of any other vertebrate. If the flight is in a cloudless condition, then low temperature found at great heights too does not bother the bird. Earlier, it was believed that vultures had a very powerful eyesight and they could spot a carcass from a long distance. But the fact is that they have a reasonable good eyesight. The basis of their modus operandi is observing other vultures. When any bird spots a dead or dying animal or human, it flies to it in a high speed. This activity of the individual bird attracts its other relatives, who are also in search of food and keep a close watch on each other. As far as feeding order is concerned, Ruppells vultures do not have as strong bills as the other vultures (e.g. white-headed lappet-faced) have. Consequently, they arrive late on the carcass by the time other strong billed cousins tear the tough carcass skin open. To find food source these high-flying scavengers react to the behaviour of other scavengers too, like jackals and hyenas.